Elan Solana Pointe Apartment Homes is a breezy seaside community designed to make coastal living pleasurable. Coastal North County offers some of the best local running, paddling, and diving in the area. Visit our world class beaches, coastal bluffs, and trails through the backside of Del Mar in Crest Canyon. Our community provides an array of thrills and entertainment to enjoy wildlife and the natural surroundings. With exceptional features and amenities, our community invites our residents to relax and socialize. The community offers spacious one and two bedroom townhome floor plans with fully equipped kitchens that include dishwashers and updated flooring and countertops. The units also feature large windows, coastal views, private balconies/patios, high ceilings, spacious walk-in closets, crown molding, optional accent walls, central heat, and extra storage space. The community boasts a sparkling swimming pool, BBQ area, assigned carport parking, a card-operated on-site laundry facility, lush landscaping, and friendly on-site Staff with full-time emergency Maintenance to meet all your maintenance needs. Elan Solana Pointe welcomes cats and dogs; please see our pet policy as some restrictions may apply. Welcome to North County coastal living at its best. Seaside, Fletcher Cove, and Tide Beach are just a few of our community's spectacular beaches. Solana Beach is outfitted with high cliffs lined to right to the water's edge and secluded beaches you can claim as your own. The community offers a mix of boutiques and art galleries, furniture shops, and other unique stores. With its gorgeous beaches, pristine coastline, year-round sunshine, and mild temperatures, this community provides access to an ultimate experience for entertaining, shopping, and fine dining. Just minutes from the Del Mar Race Track, Fairgrounds, and Cedros Avenue Design District, you will never be bored. 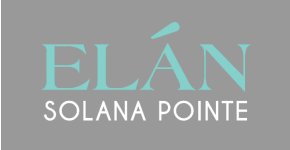 Explore our unique opportunities at Elan Solana Pointe!